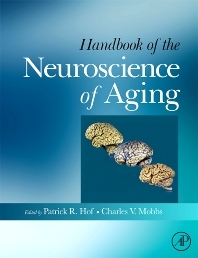 A single volume of 85 articles, the Handbook of the Neurobiology of Aging is an authoritative selection of relevant chapters from the Encyclopedia of Neuroscience, the most comprehensive source of neuroscience information assembled to date (AP Oct 2008). The study of neural aging is a central topic in neuroscience, neuropsychology and gerontology. Some well-known age-related neurological diseases include Parkinson's and Alzheimer's, but even more common are problems of aging which are not due to disease but to more subtle impairments in neurobiological systems, including impairments in vision, memory loss, muscle weakening, and loss of reproductive functions, changes in body weight, and sleeplessness. As the average age of our society increases, diseases of aging become more common and conditions associated with aging need more attention by doctors and researchers. This book offers an overview of topics related to neurobiological impairments which are related to the aging brain and nervous system. Coverage ranges from animal models to human imaging, fundamentals of age-related neural changes and pathological neurodegeneration, and offers an overview of structural and functional changes at the molecular, systems, and cognitive levels. Key pathologies such as memory disorders, Alzheimer's, dementia, Down syndrome, Parkinson's, and stroke are discussed, as are cutting edge interventions such as cell replacement therapy and deep brain stimulation. There is no other current single-volume reference with such a comprehensive coverage and depth. Authors selected are the internationally renowned experts for the particular topics on which they write, and the volume is richly illustrated with over 100 color figures. A collection of articles reviewing our fundamental knowledge of neural aging, the book provides an essential, affordable reference for scientists in all areas of Neuroscience, Neuropsychology and Gerontology. Neuroscientists, gerontologists, neurologists, neuropsychologists, and endocrinologists. Dr. Hof is the Irving and Dorothy Regenstreif Research Professor of Neuroscience and the Vice-Chair of the Department of Neuroscience at the Icahn School of Medicine at Mount Sinai in New York. He also leads the Center of Excellence on Brain Aging of the Friedman Brain Institute. His laboratory has extensive expertise in the pathology of neuropsychiatric disorders and has established an international reputation in quantitative approaches to neuroanatomy and studies of brain evolution. Dr. Hof earned his MD from the University of Geneva, School of Medicine in Switzerland. He came to the USA as a postgraduate fellow at the Research Institute of Scripps Clinic, La Jolla, CA. In 1989 he came to Mount Sinai School of Medicine as a Senior Research Associate and joined the Faculty there in 1990. He is also a Professor of Geriatrics and Ophthalmology at Mount Sinai. Dr. Hof's research is directed towards the study of selective neuronal vulnerability in dementing illnesses and aging using classical neuropathologic as well as modern quantitative morphologic methods to determine the cellular features that render the human brain uniquely vulnerable to degenerative disorders. Dr. Hof also conducts analyses of the distribution and connectivity patterns of pyramidal neuron subpopulations in the macaque monkey cerebral cortex in young and very old animals to study possible age-related changes in the neurochemical characteristics of the neurons of origin of corticocortical projections. He develops stereologic, high-resolution morphometric, and imaging tools for the quantitative study of neuroanatomical specimens and brain atlas development. Among his major contributions, Dr. Hof demonstrated that specific neurons are selectively vulnerable in dementing disorders such as Alzheimer’s disease. He has made contributions to quantifying the differences between normal aging brains and Alzheimer’s disease, as well as other mental illnesses such as schizophrenia and autism. Dr. Hof is also the curator of a mammalian brain collection that includes a large series of great ape specimens, as well as an extensive sample of marine mammals. He has contributed considerably to our understanding of the structure of the cetacean brain and has identified, in select mammalian brains, specific neuronal types in parts of the cerebral cortex known to be involved in social awareness, judgment, and attention, that can be considered as markers of adaptive mechanisms and functions in response to particular ecological pressures.